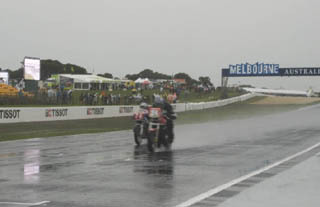 At last year's Moto GP at Phillip Island, the organisers had the courage to put on a historic race as a support class to the main event. 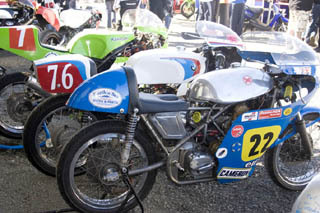 Three QEMSC members, Damien Kavney, Dave Woolsey and John Downs made the trip down to compete on their Period four bikes, even though the race was open to periods four and five and they would be up against late 70s bikes such as GSX 1100 Suzukis. It was an expensive exercise to transport bikes, riders and helpers all the way to Melbourne but opportunities like this don't come along very often, so they bit the bullet and entered, worrying about the cost later. The programme for historics was Thursday practice and qualifying, Friday, two races, Saturday one race. 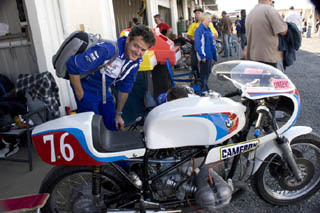 They had accepted entries from around fifty riders but there were only 38 spots on the grid, so the pressure was on for qualifying. Thurday's qualifying session nearly ended the weekend for everyone when a Suzuki split an oil line and sprayed oil all the way down the main straight. It was right in front of the GP pits and they were not happy. They wanted the historic race cancelled immediately and only some fast talking from Ken Wooton of AMCN kept us on the track. All three QEMSC riders qualified. Damien on his 500 Drixton Honda in 22nd place, John on the 1000cc BMW in 29th and Dave struggling with a sick engine on his 500 Seeley G50 in 38th. 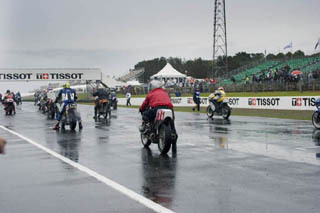 The first race was held in dreadful conditions. Pouring race and streams running across the track. Being period four, they had only road based treaded tyres not full wets like the period 5 bikes so they were never going to be on the pace, but they fronted up on the grid which is more than many riders on quicker bikes did. Damien crashed at MG corner and Dave struggled against engine trouble which turned out to be a small piece of stone in the carb. John finished in 20th place. The second race was just as bad in terms of the weather, but it was the last race of the day and it was almost dark by the time they finished. Damo stayed on to finish in 17th one place behind John but Dave's engine had finally given up the ghost and he didn't ride for the rest of the weekend. The third race on Saturday afternoon was totally different. Perfect conditions, dry track and late afternoon sun. It all ended in tears though. 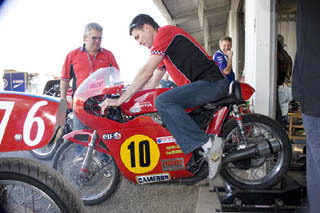 As the field hurtled towards turn one, two bikes touched and one was sent off onto the grass where the bike ( Rob Mariner's CB 1100 Honda ) cartwheeled several times and came to rest on the track spilling its fuel and oil all over the surface. The race was stopped and it took about 20 minutes to clear up before the race was restarted. Damo was lying in 18th place with John in 22nd when Ken Wooton's Honda threw a rod and laid oil around the flat out turn three. Damo was lucky to walk away unhurt when he went down on the oil spill. The race was red flagged but the result taken from the previous lap, so Damo came in 18th and John 22nd. It was an expensive trip considering the amount of track time that the riders got, but it was a great experience to be part of the Grand Prix.